This article answers just that. It will take you on a tour of the Reviewer experience in iRise Player and touch on all the important functions you can do while reviewing a project. Note: This article assumes that you are a Reviewer with View and Comment access to a project. As a Reviewer, you can review projects in iRise. Utilize the Dashboard to look at a list of your most recently accessed projects, or the My Projects tab to look at a directory of projects on your Definition Center. Once you’ve found a project to review, click on the ‘Play’ icon to open the project up in iRise Player. While in Player you can also utilize the Directory to navigate to any screens in the prototype. This allows you to bypass specific screens so that you can focus on a specific path or outcome instead of having to navigate through every screen to get to what you want. 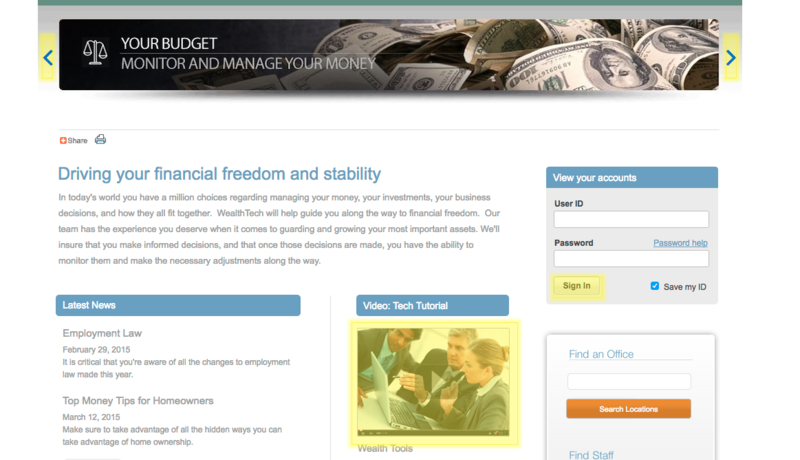 The Requirements Panel allows you to review any requirements tied to the screen you are currently reviewing. 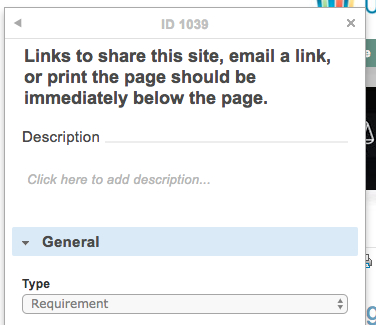 Opening the panel by clicking on the icon will show you a list of requirements complete with additional attributes. On every requirement card you’ll see the ID, the widgets pinned to the requirement, the number of comments, a direct share link to the requirement, and a link to the iRise Manager view of the requirement. Clicking on the Requirement ID will open the Attributes panel. This panel shows you all the attributes of the requirement, as defined by the Project Requirements Schema. This schema is pre-defined out of box but can be customized to adhere to your business goals and objectives. You can set these attributes via the panel, which will help you keep track of various statuses and priorities for every project. 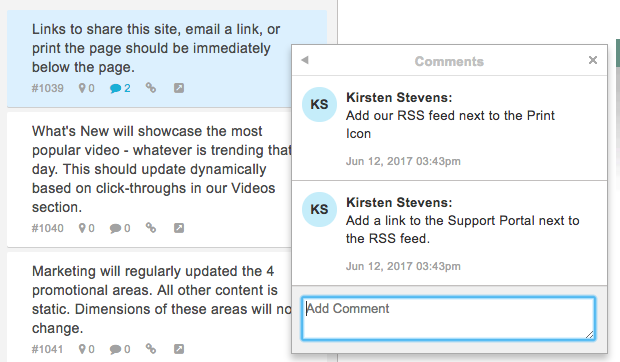 The Comments Panel allows you to keep track of comments and threads to follow the dialogue your stakeholders may have regarding specific functions or UI elements. Click on the Comments tab to open the panel and begin typing in your comments. 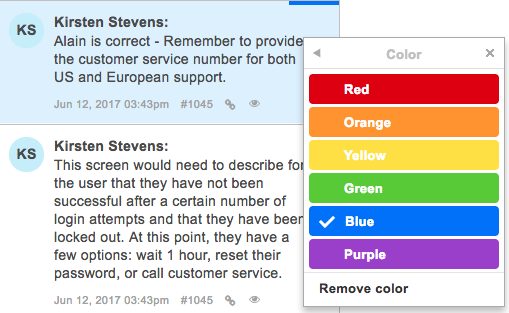 You can optionally color code your requirements to better keep track of comments related to specific topics or elements. In addition, comments can also be closed to hide them from the list of active threads. 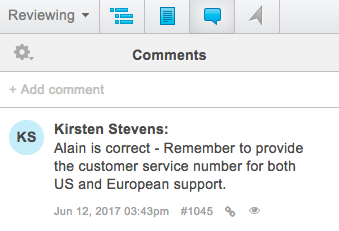 If you wish to view all the closed comments, edit the Comment Panel settings by clicking on the settings icon to show closed comments. 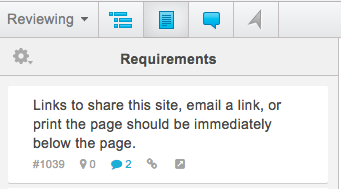 Comments can also be added to requirements. Open the context menu by clicking the icon on the top right of any requirement card and select comment to leave a comment on a requirement. While adding comments, you can mention any team member with access to the project by using the @ symbol. Typing this into the comment input box will bring up a list of users that you can tag in your comments. 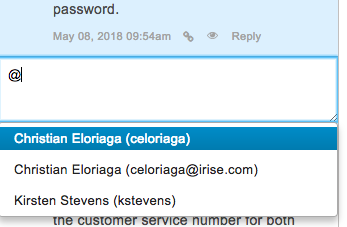 Tagging a user will send them a notification with the comment and a link back to iRise so that they can review it. While reviewing a project, there are certain features that will enable an easy and fluid understanding of the prototype. 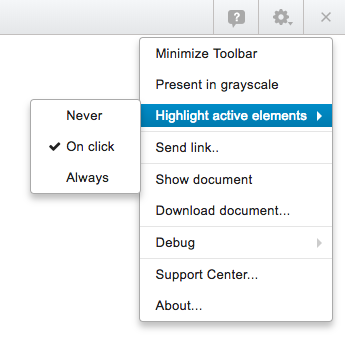 The first feature to note is the ‘Highlight Active Elements’ feature. When enabled, this setting will highlight the active areas of a prototype upon clicking a nonactive part of any screen. You can adjust how the screen highlights by using the Player Settings panel. Authors can relate requirements and comments to specific widgets on the screen, adding clarity to prototypes by giving team members and stakeholders the ability to see exactly what each requirement is referring to. This function ensures that all parties are on the same page with respect to each requirement. By giving a visual on what a comment or requirement is talking about, every item is more clearly defined to every user. That covers the Reviewer experience of iRise Player. Feel free to reach out to the team at support@irise.com to give feedback.